You fall in love with a home, settle in and then discover your backyard is sloping so badly that there’s not much you can do with it. But there is plenty you,a professional landscaper or designer can do. Chuck Monico, president/owner of CM’s A Cut Above in Omaha, works with many clients to design the kind of backyard they want even if it is sloping – and some slope steeply. The top things homeowners ask for in their design of a sloping backyard are walls, patios, lighting, terraced gardens and sunken fire pits. But Monico gets requests for a lot of unique items that you wouldn’t think could be placed in a sloping yard – like a pool. In fact, Houzz.com showcases people’s sloped lots with such items as a hillside slide, a stone ramp, built-in wooden benches and a treehouse porch. What are some other things people make turn sloping backyards into? One of the most unique requests CM’s A Cut Above has experienced was for a client who wanted to design a bocce ball court. Many homeowners also request waterfalls. “Everybody wants the sound and movement of water in the outdoor living spaces, but sometimes it can become forced when a property doesn’t have a natural fall to its terrain,” he says. Waterfalls appear most natural when the designer has an existing slope to work with. Nothing that they install should look more natural than a waterfall twisting down a hillside and cascading to a pond below. What needs to be done with very sloped backyards? Many situations require walls to be engineered due to the severity of the slope and the complexity of projects. Byers says one of their largest residential projects he was part of happened during a whole property renovation. CM’s A Cut Above became involved when the homeowner realized that the original landscape contractor had severely overestimated his ability handle the steep elevation change in the yard and accommodate her wish list of features that she wanted as part of the space. Unfortunately, this realization occurred only after much of the project had been installed. The elevation change in the build area was about seven feet, so it required some technical expertise to make it a lasting, functional space. They defined the various areas using retaining and freestanding wall stone, pavers and tiered landscaping beds. Other customized features were added to give the space a unique feel. These features included a built-in gas grill and fireplace on the lower level that held the same aesthetic as the upper fire pit. They also added the dimension of height to the space using curved cedar pergolas and tied the two levels together with a pondless waterfall that started at the upper patio and spilled the pool deck below. 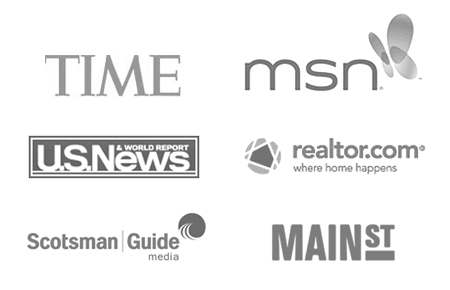 Click to check today’s refinance rates. What do homeowners need to understand about their backyard before putting together a design for it? They need to understand where the water is going to flow before you complete any significant grading projects, Monico states. They need to understand the location of the utilities, including depth of lines. Many times public utilities need to be moved when significant grading is completed on an existing property. What was the worst sloping backyard you ever had to design? Byers says the worst he has encountered was on a lake property. Waterfronts present some challenges beyond normal installation because there is usually little to no space to build walls from the lower side due to the water, and extra engineering is usually required because of poor sub-grade quality. “The reason this project was more challenging was because the 35% slope started immediately from the rear foundation, and the homeowner really only wanted stair access to the water below, not a complete wall system,” he says. They used large limestone slabs as they allow for some installation flexibility depending on how steep a certain section of the hill may be. The problem with not installing stairs as part of a larger wall system is that it is much harder to manage any drainage that runs through the area which may cause erosion issues in the future. How would you design a garden in a sloping backyard? Monico says that depending on severity of the slope, you may be able to use boulders and smaller rocks to be more creative instead of using a solid wall to create planting and garden areas. 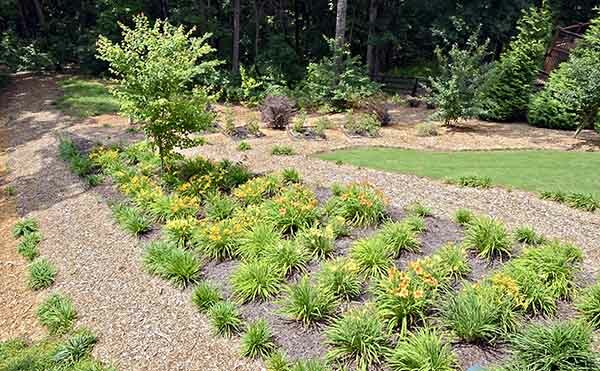 Byers adds that when it comes to good landscape design, plantings should be layered to create depth and interest in beds. Planting on hillsides or terraced gardens allows some more playful use of plants that might not regularly be good combinations on flatter spaces. What other things can someone add to their sloping backyard design to make it more comfortable and usable? Patio space can be created on a tiered wall system with enough space between walls, Monico says. Steps in between the tiers allow people to have multiple patio spaces in what was once an unusable sloped backyard. Lighting can be used above and below walls to link the two areas. You can light the trees on top of the wall and the patio on a lower tier. Next story Why Has My Credit Score Gone Up?